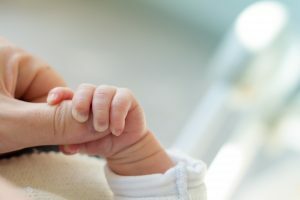 Is Baby Teeth Grinding Harmful? It’s an exciting time when your baby’s first teeth begin to arrive! They’re starting to make more sounds and experiment with solid foods, but what you may not be prepared for is hearing your infant grind their teeth. Did you know that around 30% of children do grind their teeth? So it is actually fairly common. It can be loud and alarming, but is it harmful? Your pediatric dentist explains. As with most things in life, the earlier your child begins to learn good habits for their oral health, the better. Parents often have many questions about their child’s oral development such as: How early should I begin brushing my baby’s teeth? When should their first visit to the pediatric dentist be? 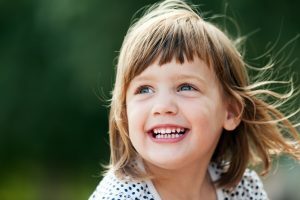 Why are baby teeth so important? Here we’ve compiled not only the answers to your questions, but also some helpful tips for building good habits early on. How Do I Brush My Child’s Teeth? The arrival of your little one’s teeth is an exciting time! Your child will soon be navigating solid foods and learning how to form sounds and words with the help of their new teeth. But how should you take care of these new teeth? Is there a right way to brush? Do you need to worry about brushing when baby teeth will fall out anyway? 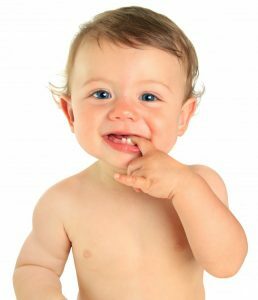 Your pediatric dentist has answers for you as well as a step-by-step guide on caring for your baby’s first teeth. Drooling, gum tenderness and irritability are all signs of a teething baby. These symptoms also result in an unhappy baby who may be fussy and keep its parents up at night. The good news is there are some steps you can take to help your child through this new phase, and in the end, they are getting baby teeth that will help them learn to eat and talk! Your pediatric dentist shares some helpful tips for calming a teething baby. 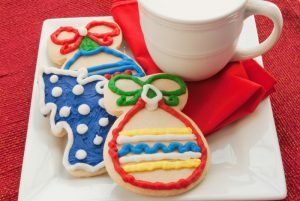 Christmas cookies, candy canes, and gingerbread houses are only a few of the traditional sweet treats that emerge around the holidays. While you won’t be able to prevent your children from eating all of the goodies available to them, you can take some steps to protect their teeth and oral health during this tasty time of year. Your pediatric dentist has some ideas! When you have a baby there are so many new things to think about. You worry about their eating schedule, their sleeping schedule, and their doctor appointments, and that’s just the beginning! What happens when their teeth begin to arrive? Should you brush them? Is it important to take care of them when they’re only going to fall out eventually? When should your child first see the dentist? Your pediatric dentist has the answers you need. Your little one’s first teeth have arrived! It’s an exciting time as they learn to enjoy and navigate new foods. It’s also a confusing time, as you have to figure out how to care for these new teeth. 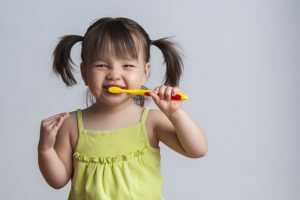 Dentists recommend cleaning your infant’s gums with a gentle cloth prior to the first tooth erupting, and then begin brushing your child’s teeth as soon as they arrive, but what kind of brush should you use? Here are some tips from your pediatric dentist on finding the right first toothbrush. Back to school is either here or right around the corner for most students and you are probably focused on new backpacks, clothes, and school supplies. A dental cleaning and checkup for your child is perhaps the last thing on your mind right now, but your pediatric dentist in SLO wants you to know that this is the ideal time to schedule your child. You’ve watched your child at the playground a thousand times before, so it’s easy for you to tell that something is a bit off today. They don’t seem to be enjoying themselves as much as they usually do. During the car ride home, you ask them if everything is OK. As soon as they look up at you, you know everything isn’t ok, even before they say, “My tooth hurts!” When you get home, you immediately take a look in their mouth. You’re suddenly filled with a basic question, “How do I know if my child has a cavity?” Cavities are very common for young children, so it’s useful for parents to know how to spot them early. Today, your friendly-neighborhood pediatric dentist in San Luis Obispo, Dr. James Forester, is going to answer this basic question, and let you know how to avoid more cavities in the future.